Feeding: Border Terriers are economical to feed, thriving on a cup of dry food per day. Temperament: The Border Terrier should have the ideal terrier temperament consisting of a good-natured, affectionate, obedient, easily trainable dog that is hard, determined when working. The Border Terrier is an alert, lively and mild-mannered. Family Dog: The Border Terrier is affectionate with children. This breed does not do well with other household pets such as hamsters, rabbits, rats or birds. They will generally get along with cats if they were raised together and other dogs including another Border Terrier but it is recommended to have a male and a female. Shedding: The Border Terrier is a very low shedding breed shedding little to no hair. Grooming: The Border Terrier's wiry coat requires weekly brushings and professional grooming two times a year. The Border Terrier's coat should be left in its natural state. The only grooming required is hand trimming of the body and tidying up of the head, neck and feet. They should be bathed only when necessary. Training: The Border Terrier is eager to please which makes training relatively easy. This breed should be socialized well when puppies including getting them accustomed to loud noises and other situations to avoid excessive shyness as adults. Barking: The Border Terrier will bark, but it is not aggressive bark. Exercise: Border Terriers have great vitality and stamina requiring plenty of daily exercise including a long daily walk. Living Conditions: As they are relatively inactive inside, Border Terriers can do well in apartment living provided they are sufficiently exercised daily. Appearance: The Border Terrier is a solid dog of medium build giving the impression of endurance and agility. The body is covered with a somewhat broken, close-fitting, extremely wiry coat. This breed is characterized as having an 'otter' head, keen eyes and alert look giving them a look fearlessness and determination characteristic of the breed. 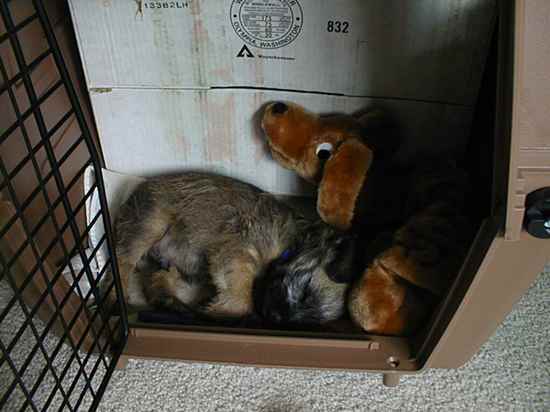 Size: The male Border Terrier weighs between 13 to 15½ pounds. Females have a weight ranging from 11½ to 14 pounds. Head: The head of the Border Terrier is similar to that of an otter being moderately wide and flat with ample space between the eyes and ears. The stop has a slight, moderately wide curve rather than a pronounced indentation. The cheeks are slightly full. Nose: The nose of the Border Terrier should be medium-sized and black in color. Eyes: The Border Terrier's eyes are medium-sized, dark hazel in color, neither too prominent nor too small giving him a look of intelligence. Ears: The Border Terrier's small, v-shaped ears should be moderately thick, dark in color, and set on the side of the head drooping forward next to the cheeks. They should not rise above the topline of the head. Muzzle: The Border Terrier's muzzle is short and full with a dark coloring and a few short whiskers. Teeth/Bite: The Border Terrier's teeth are strong and large in proportion to size of dog meeting in a scissors bite. Neck: The Border Terrier's neck should be clean and muscular with just enough length to give it a well-balanced appearance. The neck gradually broadens blending into the shoulders. Body: The body of the Border Terrier should be slightly taller than it is in length, medium-boned with a strong build and superb endurance and agility. It should be deep and fairly narrow, only the width of a man's hand behind the shoulder, with sufficient length to have proper range and agility. The back is strong and level with no sign of dipping behind the shoulder. The loin is strong. The brisket should be neither excessively deep nor narrow with deep well-laid back ribs that are not over sprung. The underline of the body should be fairly straight. Forequarters: The shoulders of the Border Terrier are fairly long and well laid-back with the blades converging gradually from the brisket. The legs are straight, of moderate bone and spaced slightly wider than a Fox Terrier's. Hindquarters: The Border Terrier's muscular hindquarters have long, nicely molded thighs, well bent stifles and well let down hocks. Gait: The Border Terrier has a straight and rhythmical gait displaying good stride length and flexing of stifle and hock. The dog's gait should be responsive, quick, free and agile. Feet: The Border Terrier's feet are small and compact with moderately arched toes that point straight forward and thick pads. Tail: The tail of the Border Terrier is fairly short with a thick base that tapers toward the end. It should not be set too high so that it can be carried gaily when the dog is alert. It should never be carried over the back. Color: The Border Terriers coat can be red, grizzle & tan, blue & tan, or wheaten in color with a small amount of white on the chest being allowed. There should not be any white on the feet. The muzzle should be covered with a dark coat. Coat: The double coat of a Border Terrier consists of a short, dense undercoat covered with a wiry, somewhat broken topcoat that lies close to the body. It should not show any tendency to curl or wave. The skin is very thick and loose fitting. Life Expectancy: The average life expectancy of a Border Terrier is 15 or years more. Characteristics: The Border Terrier is a working dog which requires him to be alert, active, agile and able to fit through narrow openings and traverse any type of terrain. Border Terrier puppies are very active and will mellow out as they grow into adulthood. When outside, Border Terriers should be in a securely fenced in area like a free-standing dog runs or fenced in yard with additional reinforcements along the bottom to ensure they can't escape as they love to dig. They do not do well when left alone all day. The Border Terrier also excels in hunting, tracking, agility, competitive obedience, performing tricks and being a watch dog. Health: The Border Terrier is very tolerant to pain and illness so it is important to keep an eye on their health carefully. They are at risk for Canine Epileptoid Cramping Syndrome (CECS) also called 'Spike's Disease' which is a recently recognized health issue hereditary for Border Terriers. Litter Size: The Border Terrier typically has litters ranging from 2 to 8 puppies with the most common being around 4 or 5 pups per litter. History: The Border Terrier got is name because it was originally developed in the Cheviot Hills area on the border between England and Scotland. They were bred to help farmers drive predatory foxes from their dens and kill them. They have also been used in hunting marten, otter and badgers. Today the Border Terrier is kept as a companion dog and in some instances still used as farm dog, helping to control vermin. This breed was first recognized by the British Kennel Club in 1920 and by the AKC in 1930.